We’ve had a month now to reflect on the fiasco that was Gov. 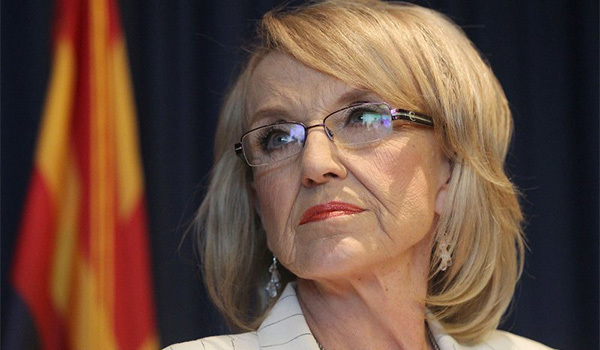 Jan Brewer vetoing a bill that would have strengthened protections for religious freedom in Arizona. So many things were wrong about the whole debacle. Only one side got its message out — and that was a message of lies and distortions. Yet the homosexual pressure groups and their compliant media easily rode roughshod over a jittery, wobbly-kneed governor and Republican lawmakers. Where were the co-sponsors of the bill? Where was their press conference? Where were their efforts to counter the lies? In the end, Gov. Brewer was pressured — like a skittish young bison calf surrounded by hungry wolves. She went into stampede mode and was no match for the “predators.” She never took the time to explain what the law was really about, how it amended an existing law, why it was needed, and why it was not the threat the radical leftists were screaming about. All she did was react to the people with the loudest, angriest voices. It was pure knee jerk reaction and cowardice. She froze like a deer in the headlight, then cut and ran. The Left is probably shocked at how easily they intimidated her. Arizona has had its own RFRA [Religious Freedom Restoration Act] since 1999. The now tarred-and-feathered SB 1062 would have modified it two ways — covering residents in the conduct of their businesses, and covering them when sued by a private citizen invoking state or local law. To label it an “anti-gay bill” as most media have done is like calling the sun anti-gay for shining on homosexuals and heterosexuals alike. To be sure, Arizona’s amended RFRA could have been invoked should a Christian florist be taken to court by the state attorney general for refusing to provide flowers for a [homosexual] wedding, as is happening in Washington state. But nothing in the Arizona amendments would have said who wins such a case, and religious adherents — as in all RFRA laws — have to demonstrate they possess a “sincerely held belief” that’s being needlessly violated. But in the end, SB 1062 wasn’t about the law. It was about jackboot politics and the growing economic clout of LGBT groups. The NFL threatened to move the 2015 Super Bowl elsewhere, and the prospect of hosting a 2016 presidential convention seemed threatened. Arizona chambers of commerce and the state’s leading newspaper all came out against it, saying it would destroy business in an already stalled economy. Bewer claimed in her veto that SB 1062 was a solution that doesn’t exist. Yet. As for the NFL, Commissioner Roger Goodell has become a shill for the homosexual agenda. Arizona was never going to lose the Super Bowl. He was bluffing in order to intimidate the governor. If big business is so right-wing, why do huge banks fund liberal and left-wing charities, activists, and advocacy groups, then brag about it in commercials and publicity campaigns? Goldberg could easily have included a lengthy list of other corporations besides banks. Leftism among corporations is rampant. The Arizona Chamber of Commerce is no different.